Digital Teacher English Language Lab not only enhances vocabulary, but also focuses on the finer shades of language like grammar, pronunciation, intonation, modulation, phonetics, MTI and syllabic division. Learners learn without any fear or embarrassment which helps build their confidence and proficiency in the language. Provides equal weightage on LSRW. A focus on ‘Mother Tongue Influence’(MTI) to overcome pronunciation differences of consonant sounds using mouth movements. 5000+ words (8 levels) with picture representation, helps the students in learning new words. In order to improve fluency Audio/Visual applications based on stress, intonation and modulation are practiced. Student can gain complete grammar knowledge. Pronunciation of consonants and vowel sounds made easy with correct syllabic division and stress patterns. Improving the knowledge of English by mastering variations in volume, pitch, speed and stress. 3000+ difficult words to recite for better pronunciation. 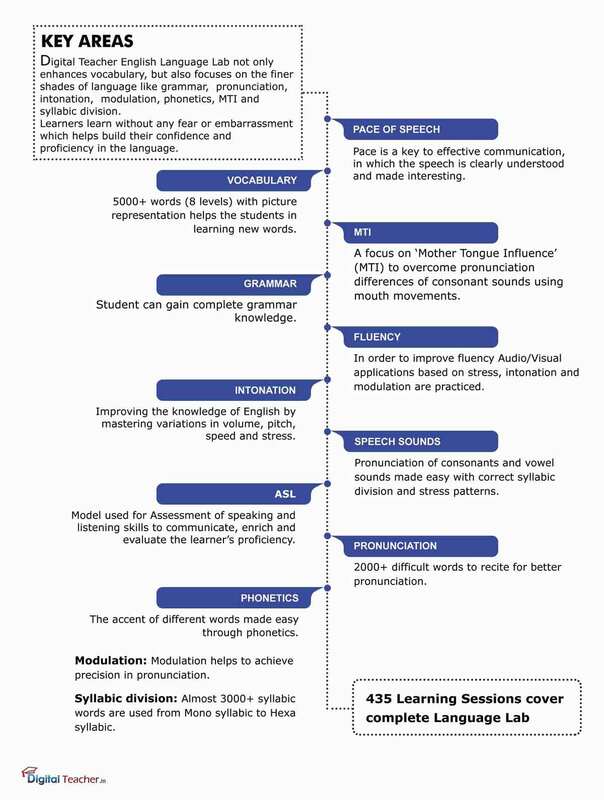 Model used for Assessment of speaking and listening skills to communicate, enrich and evaluate the learner’s proficiency. Phonetics : The accent of different words made easy through phonetics. Modulation : Modulation helps to achieve precision in pronunciation. Syllabic division : Almost 3000+ syllabic words are used from Mono syllabic to Hexa syllabic.